Surely the Varadero's days are numbered? 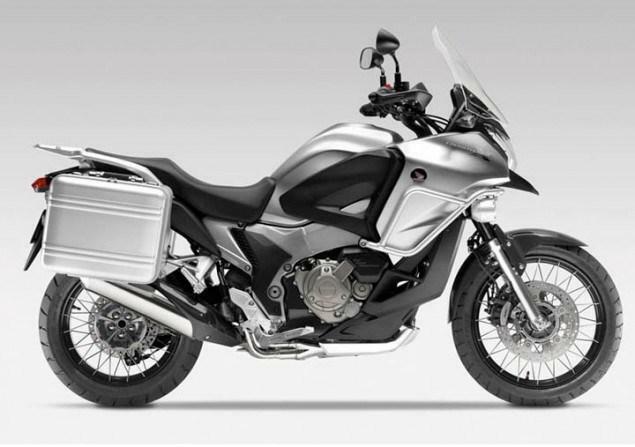 WE wrote about the Honda Crosstourer back in May this year and now Honda have confirmed it's going into production. First unveiled as a concept at the 2010 EICMA show the finished bike will be revealed at the 2011 EICMA Milan show in early November, followed by its UK debut for customers to see at Motorcycle Live show from 19-27 November. The Crosstourer is pretty much all it looks like - a VFR1200F in adventure bodywork. While they haven't released pictures, the production version is going to be tweaked on the styling front - the side panels are slightly different and the seat unit sides are more GS-ish (ie there's less in terms of bodywork, more in terms of pannier mounts and metalwork on view). However, you need to look pretty closely to spot the changes from the concept version they showed last year. The machine will also be offered with the option of Honda’s innovative second-generation Dual Clutch Transmission technology. Honda claim the Crosstourer offers a unique and versatile package that will provide great all-weather, all-road capabilities. Will it be as big a seller as the VFR1200F?